Happy Cinco de Mayo everyone! In honor of today, I have a special taco recipe from Chef David Dworshak, of Takito Kitchen, to share with you. If you haven't been, the food at Takito Kitchen is awesome; they are always using seasonal ingredients and supporting local farmers and producers. Chef David's dishes are very creative, and a represent a healthier style of Latin American food. Here's to David and all his wonderful creations! Now go out and try this recipe!!! What are your plans for Cinco de Mayo? Season the chicken with an adobo, seasoned salt or salt and pepper, 1 day ahead if possible. Start gas or wood grill. Simmer chicken in broth with remaining ingredients for 20 min., skim any foam or scum away. Remove chicken pieces, and cook on grill until well browned. Return the chicken back to broth and cook until fully cooked. Clean chicken off the bone and skin. Reheat chicken in 1-2 cups of strained broth. Add 1c. To taste of herb purée once chicken is warm, adjust seasoning and add 1t apple cider vinegar or lime juice. Grill or roast the scallions, blanch and shock the herbs, rough chop and purée with the least amount of water possible. 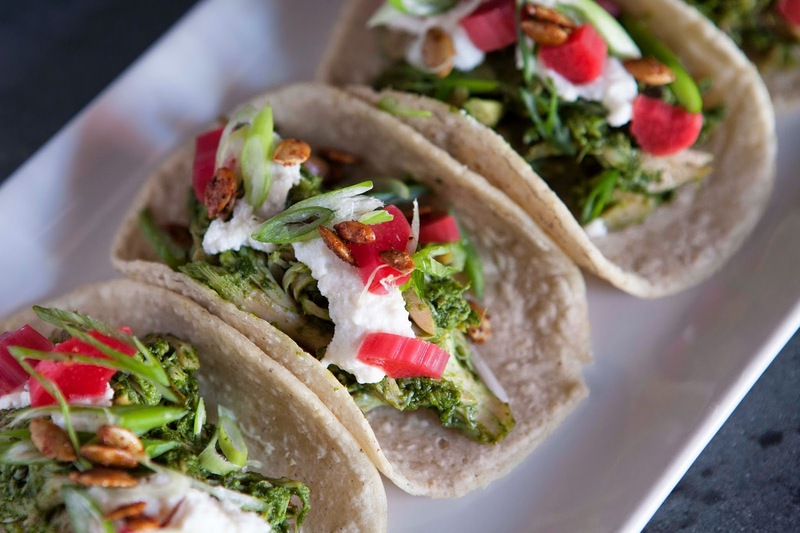 Serve with fresh tortillas, cheese, pickled vegetables, cilantro and toasted pumpkin seeds. Enjoy! I'm a big fan of Mexican food myself, and these tacos look delicious! Hope you had a good Cinco de Mayo!